Our high school is involved in a 2-year EU Comenius project titled 'Dismantling stereotypes - Finnish, Spanish, or other...'. Our partner school is I.E.S Juan del Enzine, in León, northern Spain. Apart from project work on the theme, during these two years, 2-week reciprocal students exchanges are organised for a group of students and teachers from both schools. During the exchange, students stay with the families of their hosts, go to school, work together on the project theme and visit places of interest in the host country. After an eventful two weeks of our Spanish partners visiting us last April, it was our turn to return the visit in October. I and a colleague took a group of 14 students to get a taste of some exciting southern lifestyle first-hand and to test the validity of their pre-conceptions that they had reflected on before departure. 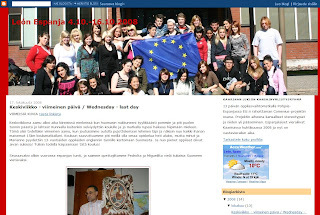 This time, to make use of Web 2.0 tools, I had set up a blog to record day-by-day experiences of students and to upload pictures - all this almost in real time - for family and friends back at home. Each student was in charge of reporting on one day of the stay. Each student rose to the challenge and produced their share on time - despite our hectic schedule. And the texts and the photos were greatly appreciated by their families back in Finland, who later said that it gave them the opportunity to take the trip virtually with their children. Some parents and friends also sent comments while we were away. Something we didn't anticipate was that our Spanish partners also got interested in what we were writing, and of course looking at all the photos. So much so that they persuaded us to translate the whole blog into English, so they could read it as well. And to complete this snowball effect of interest, it is now even being translated into Spanish so that all their families will be able to read it, too. I wish now that there had been a similar blog for the Spanish visit to us last spring! Oh well, next time... I can truly recommend this to anyone doing a student exchange. It's well worth the effort, and with the modern tools relatively easy, too.